The Abe administration is seizing the foreign policy initiative from Japan’s bureaucracy. Despite much attention being paid to Japanese Prime Minister Shinzo Abe’s diplomacy and domestic reforms, his administration’s approach to foreign policymaking has largely eluded examination. Meanwhile, his current, second premiership has marked a significant change in the decision-making process, with the Japanese bureaucracy’s traditionally strong clout being eroded. The prime minister has come to exert more control over the Foreign Ministry through the Prime Minister’s Office, or the Kantei. As a result, the very source of Japanese diplomacy has shifted from the bureaucratic institutions to the Kantei, while foreign policy officials, previously largely responsible for crafting Japan’s international strategy, have rather been relegated to simply implementing the policies decided at the executive level. According to the conventional wisdom, policymaking in Japan is only efficient when the leader cooperates with the bureaucracy, enjoys its support, and makes use of its expertise. This became especially apparent during the short-lived premiership of Yukio Hatoyama from the Democratic Party of Japan (DPJ). Hatoyama and his fellow party members wished to achieve “political leadership,” whereby major policy decisions would be made by people’s representatives rather than unelected officials. Thus, the Hatoyama administration tried to neutralize bureaucratic influence and instead empower the executive branch. However, despite various administrative reforms, it only managed to weaken the bureaucracy rather than strengthen the politicians. Because the DPJ had no prior experience of governing, while bureaucratic advice and expertise was deliberately shunned, Hatoyama presided over perhaps the most poorly coordinated, incoherent, and confusing period of Japanese foreign policy. Naoto Kan, who succeeded him as prime minister, had to quickly wrap up the “political leadership” experiment and bring the bureaucracy back into the fold. It was evident that openly going to war with the bureaucracy can only hurt policymaking. By contrast, Abe signaled his desire to closely cooperate with the officials soon after being appointed prime minister in December 2012. At the same time, his approach to foreign policymaking was very hands-on and he gradually started tightening control over the Foreign Ministry, while relegating more authority to the Kantei. 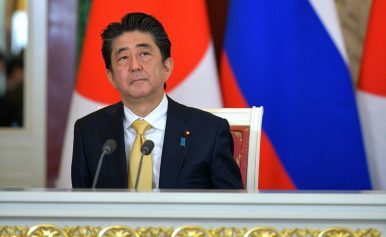 Abe’s grip on diplomacy has become so substantial that he has achieved virtually free rein in implementing his agenda without having to particularly worry about a backlash from the bureaucratic establishment. There are three factors which account for Abe’s success in curtailing bureaucratic power and retaining the leading position in foreign policymaking. First, as Markus Winter pointed out in a previous analysis for The Diplomat, Abe’s political longevity as prime minister stands in contrast to the “revolving door” of Japanese leaders. Despite most prime ministers since the late 1980s only occupying their position for about two years, Abe’s tenure has already lasted for six years, making him the third longest-serving Japanese prime minister. Such stability is also characteristic of some other members of his government. For instance, Fumio Kishida remained foreign minister for five years until 2017, whereas Chief Cabinet Secretary Yoshihide Suga (responsible for coordination between the cabinet and the bureaucracy) and National Security Advisor Shotaro Yachi have retained their positions throughout all the government reshuffles. Because of that, the Abe administration managed to cultivate a deep rapport with foreign policymaking officials, making it easier to push them toward implementing its agenda. Equally, the bureaucrats understand that unlike many previous prime ministers, Abe has both the time and the power to see his initiatives through, and thus they can no longer ignore or stymie the government’s policies. Second, Abe augmented the powers of the Kantei to achieve centralized top-down policymaking and ensure the bureaucracy’s compliance with his agenda. Such a personal leadership style exercised by Abe might be explained by his first, unsuccessful stint as prime minister in 2006-2007, which was partly ruined by the mistakes of his appointees. Therefore, when he returned to the government in 2012, he decided to maintain an iron grip on decision-making and be as deeply involved in it as possible. At the Kantei, the implementation of Abe’s policies by the bureaucracy is overseen by the aforementioned Chief Cabinet Secretary Yoshihide Suga, one of the most powerful members of Abe’s team, who seemingly does not possess any particular ideological bent and is primarily guided by notions of efficiency. Suga’s extent of involvement in the political process is so great that he allegedly insists on personally reviewing every policy related to China. In an effort to further shift power from the bureaucracy to the executive, Abe created a new body called the National Security Council (NSC), which reports directly to the Kantei. The NSC, tasked with crafting Japan’s security strategy, was headed by Shotaro Yachi, Abe’s foreign policy advisor. An ideological ally of Abe’s, Ichiro Komatsu, was appointed head of the Kantei’s Legislative Bureau. Another example of Abe trying to shift the initiative in foreign affairs away from bureaucratic institutions may be seen in his appointments of the aforementioned Kishida, as well as Itsunori Onodera, both considered political lightweights, to the positions of foreign minister and defense minister, respectively. Finally, Abe ensured compliance from foreign policy officials through the system of personnel appointments. In 2014, his administration established the Cabinet Bureau of Personnel Affairs led by another Abe ally, Katsunobu Kato. The newly-minted body gave Abe and Suga the power to appoint over 600 bureaucrats to senior positions in various ministries and agencies, a major increase over the authority of previous governments. More importantly, while the prime ministers before Abe could oversee the appointment of 200 officials to top positions, they rarely availed themselves of that power, instead mostly rubberstamping the already decided-upon promotions. By contrast, Abe actively used the expanded authority to personally supervise senior bureaucratic appointments, thus swaying the officials, albeit indirectly, toward implementing his agenda. For example, Abe appointed yet another political ally of his, Akitaka Saiki, to the position of the Foreign Ministry’s administrative vice minister. Inherent in such a personalized policymaking approach, however, is a risk of tightening the reins over the bureaucracy too much. Should that happen, the officials might stop voicing objections to questionable policies for fear of the government thwarting or ending their career aspirations. The bureaucracy becoming little more than a rubberstamp for the executive branch and saying good things instead of the right ones threatens to undermine the checks and balances system necessary in a democratic state. While the Abe administration did not make lofty promises of strong political leadership or directly threaten bureaucratic interests the way the DPJ government initially did, it has achieved remarkable success at limiting the bureaucracy’s traditionally outsized role in foreign-policy making and ensuring a streamlined and smooth implementation of the prime minister’s diplomatic agenda. By exerting control over the officials through a more personalized staffing policy, Abe has effectively made them follow his lead. Although this approach is fraught with the danger of the bureaucracy eventually ceasing to provide a counterbalance to the cabinet’s proposals and is highly contingent on the prime minister’s political will, as well as the competence of his team, for now Japan’s government has managed to wrest control of decision-making from the bureaucrats and secured their support of its policies. Dmitry Filippov is a Ph.D. candidate at the School of East Asian Studies, the University of Sheffield.